Tamarins are squirrel sized New World Monkeys indigenous to Central and South America including the Amazon Basin and Northern Bolivia. They are not however found in mountainous areas at higher altitudes. They are tree living monkeys and are diurnal, foraging by day and sleeping at night. 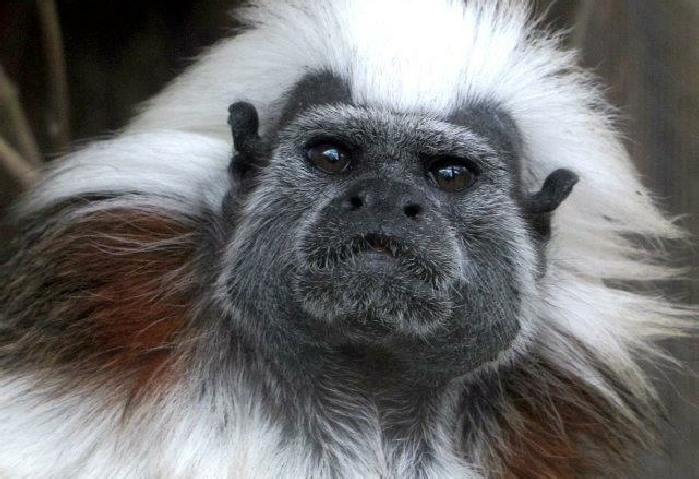 Tamarins vary in colour from all black to brown, red, white and mixtures of these colours and a striking feature of many species is a prominent moustache or a crown of long hair. They are all relatively small monkeys, varying in body size from 18 to 30 cms (7 to 12 inches) and with long tails of 25 to 44 cms (10 to 18 inches). They live in groups which may contain several families and total up to 40 members, smaller groups of less than 15 animals are however more common. Tamarins are omnivorous, eating amongst other things fruits, green plants, spiders, insects, small vertebrates and birds eggs. They are monogamous, mating for life and usually giving birth to twins, which the father cares for most of the time, with the mother carrying out nursing and transportation duties. Other group members help care for infants and help with foraging and predator watching vigils. Major predators include cats, snakes and birds of prey (raptors). Most species are threatened by habitat loss due to the activities of man. Some are now critically threatened. Click here to read about Chewy and his friends at the Sanctuary.